Fasteners apply controlled pressure between joint members. These fasteners prevent joint members from twisting and buckling. Great for joining countertops. 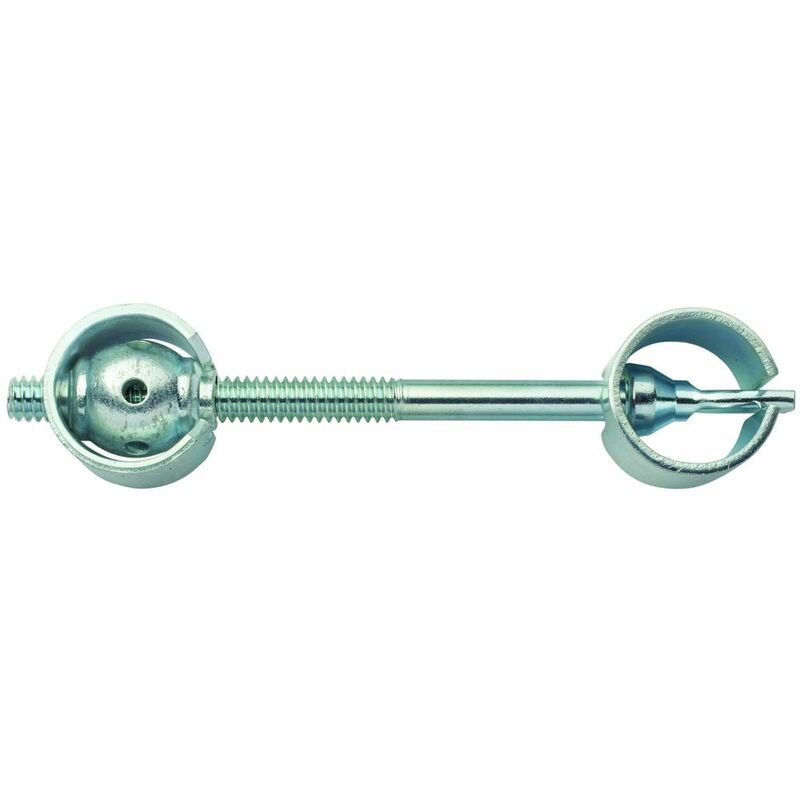 4-1/16" long bolt allows a center to center range of 2" to 3-1/2". 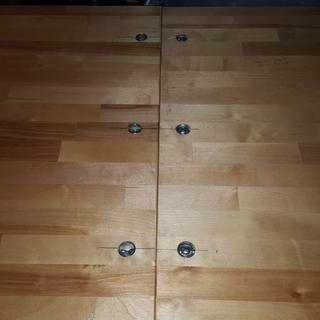 used the joint fastener on our butcher block counter top. They worked great. I also glued some biscuits in the joint as well. The joint fasteners work well to draw in the seam tight especially on a curved section of the counter where clamping was more difficult. I used them two years ago to attach walnut butcher block that was 1 1/4 thick. They worked great. These are great! I have used them in outdoor applications and they perform well. Installation of the fasteners was a simple task, saved me hours of biscuit cutting, pinning and gluing. I've never cut or worked with butcher block counters before, done a very nice job. No more OLD SCHOOL for me. I'm sold on these site fasteners! used these on a 12 foot bar top and worked very well pulling the joints together. for the price and size, would definitely recommend them. Good product. It joined wood stock firmly. Great device for attaching breadboard ends. I'm a beginner woodworker and this product worked great for me to join two pieces of counter top together. Very simple using the joint fastener along with the template. Overall they worked for me very well and i liked them because i did not have to mill anything just holes. But they are difficult to draw tight as you only have a tiny 1/8" hole to tighten with. While they are easier to use i think the old style with a bolt and nut is much better in tightening with an actual wrench. They did work though and saved me time. I used these to join counter tops, If you read the product description it is self explanatory. If you have questions the Rockler folks are very helpful with most of their products. They work very well for joining joints for a tight fit, have used several different types and these seem to work well, for what they are designed for! Thanks Rockler for a good product! I bought the drilling fixture and the special spade bit as well as three joiners. The instructions say to "first drill the 7/8" hole. It does not say "The 7/'8" hole MUST be drilled first. If you drill the 7/16" hole first the spade bit will catch in the cross hole and snap off. If that happens (and it happened to me) then you have to finish the project with a 7/8" forstner bit. Also drill the 7/16" hole a bit past the end of the 7/8" hole so you have room to tighten more than anticipated. A piece of masking tape will hold the retainer ring in place and keep if from falling out if you have to work underneath as I had to. I tightened the fastener as much as I dared in the butcher block as I was afraid that the hole might blow out. Still the piece shifted after in place. I should have added a spline to prevent this. Glue was a no-no as I was joining face grain to end grain. So an unglued spline or even an unglued biscuit or two would have prevented the shift. I used these to tie three surfaces on a u-shaped desk together. The pieces were 3/4" thick maple plywood with a 1/2" mdf laminated to it for depth and heft. I had 3 fasteners at each 24" long joint. I was able to draw the pieces up flush and tight in both the horizontal and vertical direction. The tite joint drill bit is a piece of junk stamped bit. Do not get it. Use a good forstner bit instead. You will need the tite joint drill guide. I will use these for future projects. The joint fasteners worked great, after I used 'my' paddle bits to cut the recess. 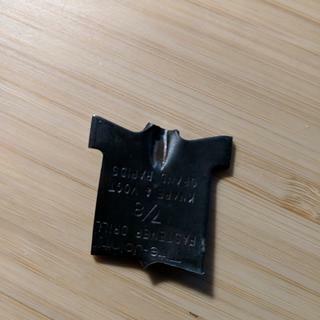 The blade that I purchased with the fasteners 'broke' at the stem on the 2nd hole (and really didn't work very well on the first one}. I found the blade to be a piece of junk and would 'highly' recommend 'not to purchase it.' The jig works acceptable and required a little work to clamp it to the wood, but was functional. Unfortunately the Tite Joint Fastener proved to be poorly designed. having followed the instructions installing 5 of them in a 5/4 mahogany desk top the protruding end of the bolts extended around 3/8" beyond the circumference of the 7/8" hole so I had to carefully rout a 1/2" "channel" extending out to accommodate it. VERY poor design, tedious installation but with that correction they are in place and so far working OK. I bought these to join two pieces of Ikea slab counter tops for a non-standard cabinet depth. I bought these to avoid the cost of buying extra long pipe clamps. I used a doweling jig to perfectly center dowels to reduce misalignment and sanding. But I also glued the pieces together... belt and suspenders I guess. In hindsight, I'm glad I did this. Probably my biggest complaint is that the bolt will not be centered in your counter top's thickness. 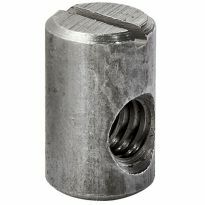 Meaning, you bore a 5/8" deep hole for the round "sockets", but the bolt is centered on that 5/8" depth. So this means that the clamping force will not be applied evenly, and it will pull the two counter top sections out of alignment, biased toward the bottom side of the counter top. So you'll end up with a cupped counter top. It also means the joint will be tight on the bottom side of the counter top, and open on the top (the show face). So your counter top will not be flat, and the joint line will be open on the top. In my case, since I also glued the joint, I was able to clamp some cauls on the top to pull it flat and close the joint on the top side of the counter. But I don't really expect my counter to be flat after this. Another thing- the jig and spade bit they also sell to go with this is a great idea, but is super poorly executed. You can tell the bean counters had their way with the design. The spade bit's shank is rolled steel, not solid. Meaning, it's hollow. I had one of these spade bits snap on me right where the shank reaches the spade section of the bit due to this super cheap design.. Luckily I live close to Rockler and they had one more in stock. So when you drill, go slow and try to hold your drill square so that you don't get a lot of chattering- that's what will break the bit. you might just want to use a quality forstner bit instead of the jig and spade bit. Just follow the directions very carfully and use a center punch for your holes. So, my advice- just get some really long pipes for your pipe clamps, use a centering dowel jig for alignment, and do a regular old glue-up. These bolts ended up really complicating the process compared to a simple glue-up, and I don't think i got nearly as good of a result. Look closely at the drill bit sold to install this fastener and see it's a stamped metal bit. I had eight holes to drill and it broke on the first one. Maybe oak was too dense? Seems like for $5 they could still provide a better bit, one that would hold up well enough to be used again. Actually, the bit I modified retails for $2. Clearly, if it's made of stamped metal, it isn't meant to last for more than a job or two, if that. Bought the jig and spade bit. The bit comes rusty. 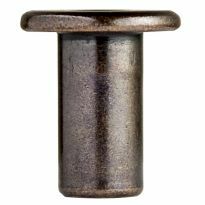 It doesnt spin true and does not have a real shaft (its just rolled steel). It's not that sharp either. After drilling one hole, the shaft broke after getting 1/8 deep. Complete junk. Building a bunk bed that will be knockdown. I am replacing the wood body of a 1934 Buick. I plan to use these to attach the A pillar to the dash brace with these, and then cast the gap with RTV rubber to end up with a strong, but flexible, joint. 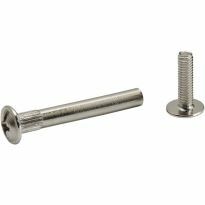 I'm interesting in the type of bolt used (1/4" 20 threads) I only need one end of the part for a repair project of a home made drafting table. Excellent reviews. 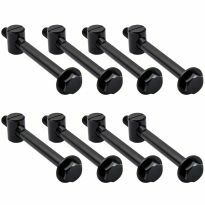 Seems to be the Cadillac of miter bolt / connector bolt hardware (with a price to match at 3-4 times the cost of other connectors). I thinkit will give me a very tight fit. they make a good tight joint when using 2 part hutches etc. I was missing three on our bed. Used Furniture. To connect 1.5" Oak butcher block counter tops. I have a wall unit that requires 4 tite joint fasteners. the originals were misplaced during a move from Florida. I like the way the fasten the butcher block top together. Joining 2 countertops together. Wasn't available from any other merchant with decently fast shipping. I've used them in the past and have been very happy with the end result. Need to join some counter tops. We are installing butcher block countertops and this is to connect the seams. These were purchased to join laminate counter top (particle board base) sections together. Work great. these work great to attach bread board ends on table tops because they allow the end grain and edge grain to move independently of each other, yet maintain a tight joint. For a table I will be building. Will be making a butcher block countertop and will use these to join together 2 pieces. I have an application that requires these fasteners and Rockler had them as well as the jigs and bit. It just made sense. Clean, adjustable miter joints on a counter top without the permanent commitment of glue? No brainer. 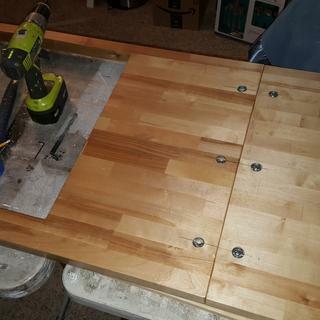 Using this to join butcher block counters from IKEA. Hopefully it works well! These joint fasteners are sturdy and effective. this is a simple effective device to pull two halves of a large counter top together. Can I use this on a Counter that is 1-1/2" inches thick? How to use joint fastner? BEST ANSWER: Best to order the layout jig and bit for easiest installation (& it's pretty cheap too) but if not, all you do is bore an appropriate sized hole for each end of the "dogbone" and a connector hole between each. This is on the underside of each part that you intend to join. Once you get the threads started, you just tighten each end down using an Allen wrench or the like. The mechanism works on the same principle as a turnbuckle where one end is standard threaded and the opposite end is reverse threaded. Hope this helps. As Matt F responded, buy and use the line-up jig. It requires quite a large hole so measure and drill accurately if you are working with thinner wood. Works great for keeping wood table leafs pulled together snug. we are getting ready to install 1 1/2 inch thick American Cherry butcher block countertops, will these work to attach the 2 pieces? BEST ANSWER: Yes, these will work just fine. We used them on 2 inch thick slabs of ash for a counter top. 1 1/2 inch thick will be plenty thick to set these into. Btw...buy the drill jig. Worth the money. Yep. Just follow the directions. Does the hole need to be 5/8" deep? I'm looking for something to join 3/4" plywood, and I don't care if it protrudes from the bottom a little. BEST ANSWER: I used these for joining a mitered corner on a countertop so I drilled the holes 5/8" deep, in 3/4" material drill as deep as possible to keep the fastener from pulling out. Use a forester bit so you have a flat bottom hole. Yes, it will be fine to drill 5/8" deep in the 3/4" thick stock. Actually, it won't protrude out that much. good luck. Probably not, if you're not worried about it protruding below. Just make the necessary adjustments and it should work. The Tite Joint drill guide seems to be designed for 3/4" thick counters. For a 1.5" countertop do I need to drill the large hole deeper than 5/8"? And maybe make adjustment for the smaller hole to be at the center of countertop thickness? BEST ANSWER: I use 7/8" Forster Drill bit and Tite-Joint Fasatener Drill Guide. You can drill as deep as you want, max. 3/4". That will make Tite-joint "barbells" in drilled holes, under the outer surface edge. Good luck. You can, but I don't think you need to. It would be good if you could make the adjustment for the smaller hole. I drilled the hole slightly deeper than 3/4" and it worked fine. Do they come with the tightening tool? BEST ANSWER: No, but a hex key does a great job to tighten them. These little gizmos are very cool. One point to remember: Be sure there's room under the counter top for access to the fasteners. No. Tighten them using a drill bit. how far apart should they be installed on a 2 inch thick walnut counter top? I put mine every 12 inches. That should be good! what should be used to tighten? I used a nail set but it broke. Is there a tool for tightening? Can the through bolt be substituted with a hanger bolt for one-sided installation? BEST ANSWER: Yes, you need to use '1/4" - 20' type hanger bolts, and don't forget to use bolts that are long enough for clearance - I use hanger bolts that are a total of 4 inches long. I don't know. I cannot give you any alternative idea you asked. 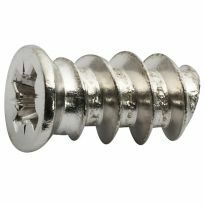 It would be better if you ask directly to any Rockler staff regarding this fastener. What are are the measurements? BEST ANSWER: The 4-1/16" long bolt allows a center to center range of 2" to 3-1/2. I'd like to use these to fasten two halves of an 11 ft long reloading bench top together. The benchtop will be 2.5" thick. Will these work? If so, will the normal template be fine for these or should I drill down a full 1 1/4 inches? I want the bench top split so it's easier to carry it up a flight of stairs, will not make the turn in the stairs at it's full 11 ft length. Thanks!
. These fasteners are for permanent installation and the wood join they hold together is glued also. You may need a piano hinge or drop-leaf hinges to do the join. How many of these are needed for a miter joint of 25" counter top (approx 36"). Also, are dowels and/glue recommended? can this be used to join 2 mitered joints in a perpendicular fashion (one leg horizontal to a vertical leg) on a wood countertop? BEST ANSWER: I'm not 100% sure I follow your description but essentially this fastener will work on any joint where you have access to the same level plane for each end of the fastener so long as there is enough material to bore into. Do you make a tire joiners fasteners that's half inch deep on the ring?